There is a wonderful series of parks, preserves, and running trail options in the hills close to Rt. 280. It’s amazing how different the terrain is here compared to the waterfront trails just a few miles to the east. Rather than recommend specific routes, in many cases we provide a trail map and discuss some options. One will generally need a car to get to these areas. one of the most accessible running options in the hills west of I-280 — only a mile from the exit, 3 miles from Apple’s HQ in Cupertino, and a 10 minute drive from downtown Mountain View. This is a 4,000 acre open space preserve and 165 acre country park. There are beautiful open meadows, fields, wooded trails, and a farm. There are some easier, paved loop trails in the park and 24 miles of hillier hiking type trails in the preserve. Some good loop options for runners are: Wildcat Loop Trail (3 miles, easier); Black Mountain Trail (4 miles, hillier); and PG&E Trail (3.7 miles, 1600 foot elevation gain). Start: Northern end I-280 at Hillcrest Blvd. Southern end: I-280 at Crystal Springs Rd. 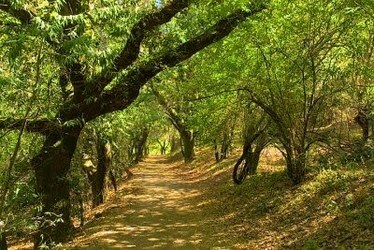 The Sawyer Camp Trail is a popular and accessible paved trail that parallels I-280 between Millbrae, near SFO, and Crystal Springs. 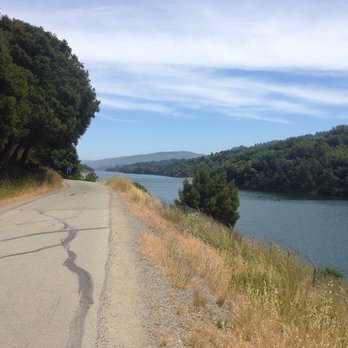 The trail is 6 miles one-way, and has a mix of terrain, from forest to a sections along a reservoir and the San Andreas Dam. It is fairly flat, except for a nearly 200 ft. hill at the northern end near Millbrae. At the northern end, it’s possible to continue north on the San Andreas trail for about 2 miles. This 900 acre preserve is also easily accessible, about 3 miles off I-280/Rt.84. Trails are mainly wooded. There are gentler forested trails with a wonderful variety of trees, and some steeper trails into canyons popular with mountain bikers. If you’re there on a Sunday, there’s a nearly 3-mile section of Canada Rd. between Hwy 92 and the Fioli entrance that is closed to cars. One can connect to nearby Wunderlich Park using the 2.7 mile, relatively flat Skyline Trail. For those who want hills, try the Dean and Chinquapin trails. Richards Rd. is the widest and longest trail at 2.7 miles, but it is quite steep. $6 admission fee. Great option on a hot day. Another hillside park with wonderful trails of redwood groves, open meadows, and beautiful oaks and madrones. Easily accessible from I-280/Rt. 84, and about 8 miles from Palo Alto, and with good parking. Once the Folger family ranch, the estate stables and buildings have been well preserved and are a good spot for a picnic. There are numerous trail options. 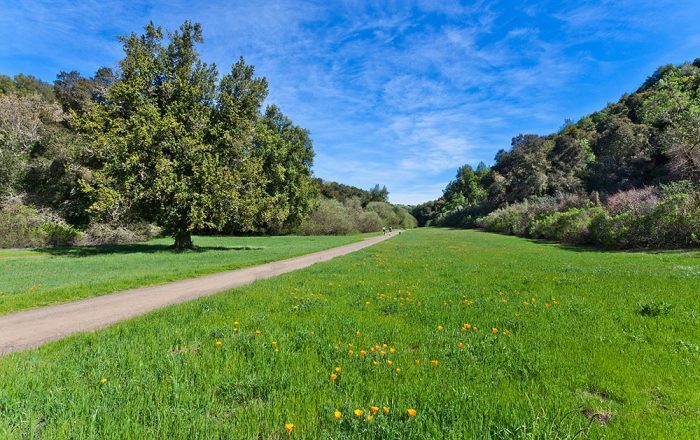 Good for runners are the Loop Trail (wider road); the more open Meadow Trail; and the 2.7 mile, relatively flat Skyline Trail that connects to Huddart Park. The Madrone Trail is a wonderful but more challenging. Note: it can be hot here in the summer. Lovely mix of rolling savanna grassland and evergreen forest. 10 miles of trails, some closed seasonally. Fairly hilly.2 miles from I-280 Exit 20. Note: only open at 8am. 1400 acre park, with trails through rugged chaparral, woodlands, fields, streams, and a lake, with great views of the Bay. Only 2.8 miles from I-280, Page Mill Rd. Note: Web page says only open to Palo Alto residents. Situated at 2,000 feet. This area is beautiful but more for trail running. One gentler option is 1.5 mile “San Andreas Fault” trail with interpretive information. 7 miles west of I-280, Exit 20 Page Mill Rd.